In order to install new storm drain line under Bellevue Way SE and set precast concrete girders adjacent to Bellevue Way SE, Sound Transit’s contractor plans to close all lanes of Bellevue Way SE from 7 a.m. on Saturday, January 26th through 9 p.m. on Sunday, January 27th. All ramps between Bellevue Way SE and I-90 will be closed. Vehicle access and parking at the Winters House, Blueberry Farm Sweyolocken Boat launch will not be available during the closure. All lanes of Bellevue Way SE between the ‘Y’ at 112th Ave SE and I-90 will be closed. Local access will be maintained to all residential driveways along Bellevue Way Southeast. Emergency access will be maintained. 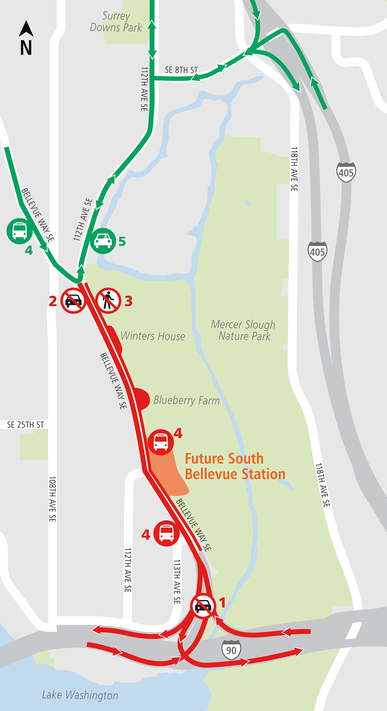 Bus stops on Bellevue Way Southeast, south of the ‘Y’ at 112th Avenue Southeast will be closed and riders will need to use alternate stops located on Bellevue Way Southeast, north of the Wye.